January 22, 2018 – Since 2011, the Space Foundation’s International Student Art Contest has inspired children around the globe to envision the possibilities and adventures to be found in space. 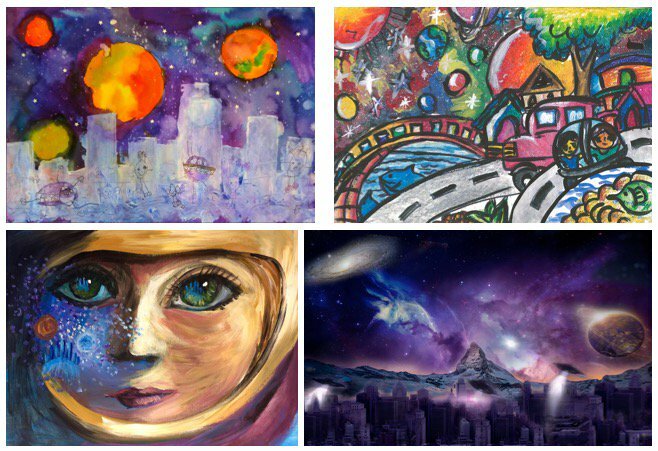 The 2018 contest theme was “My Space City Vision…” and 4,578 entries were submitted from 57 countries and 37 U.S. states by students ages 3 through 18 years. Of those, 25 winners from 13 countries were selected, with one entry chosen for the top Space Foundation Achievement Award. The contest was created by the Space Foundation’s Director of Marketing, Nancy Reed, who, as an artist herself, understood the excitement of creating original artwork for competition in a contest format. “It has been fascinating to see the contest grow and take shape over the past eight years. Most of all, and most rewarding, is the realization that each art entry received from around the world, involves a budding, hopeful and talented student artist, with creative aspirations and hope that their artwork will be a winner. It is also inspiring to witness how art transcends politics, cultural differences and ideology. It is obvious children universally love space and our planet, no matter where they are from,” said Reed. The winning entries will be shown at the Space Foundation’s 34th Space Symposium, to be held April 16-19, 2018, at The Broadmoor in Colorado Springs, Colorado. After the Symposium, the winning art will be displayed at the Space Foundation Discovery Center in Colorado Springs. Winners will receive a certificate and award letter, ribbon, signed autograph from retired NASA astronaut Maj. Gary E. Payton, USAF (Ret. ), an art kit, drawing book and Astronaut Ice Cream, provided by Astronaut Foods®, a Space Foundation Space Certification Partner. The 2018 winners are listed by first name only in consideration of the children’s privacy. Winning artwork submitted for this year’s contest can be seen on the International Student Art Contest website gallery at http://art.spacefoundation.org/winners-gallery/2018, and all of the submitted artwork can be seen at http://art.spacefoundation.org. The Space Foundation’s International Student Art Contest needs sponsorship in order to continue. Please help keep this inspiring contest alive with your sponsorship support. For details, please contact Nancy Reed at NReed@SpaceFoundation.org.